Once the family home of Mabel and Leslie Cheek, this extraordinary 1930's estate serves the public as a botanical garden, woodland sculpture trail, and art museum, with its Georgian mansion and 55-acres of cultivated gardens, which features expansive vistas. Cheekwood presents world-class art exhibitions, showcases breathtaking gardens, and offers educational programs as well as seasonal festivities to the community of Nashville and its visitors. Embark on a self-guided tour and discover all that this estate has to offer with the luxury of moving at your own pace. In addition, children’s activity pamphlets and scavenger hunt games are available at visitor services. 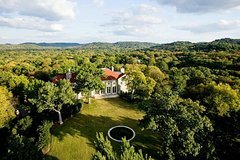 Cheekwood Estate is located at 1200 Forrest Park Drive and is approximately 8 1/2 miles southwest of downtown Nashville. The property sits upon 55-acres of beautiful botanical gardens and also serves as an art museum. Take a self-guided tour and explore the estate at your own leisure. Experience the house where Joel Cheek invented Maxwell House Coffee back in 1892 and then see some amazing artwork on the Carell Woodland sculpture trail. Guests can also enjoy the mansion, which provides visitors the opportunity to step back in time and see life from the view point of the Cheeks. The estate is kid-friendly and offers fun activities for children of all ages. In addition, it features two model trains that run on three separate tracks as well as a whimsical tree house.